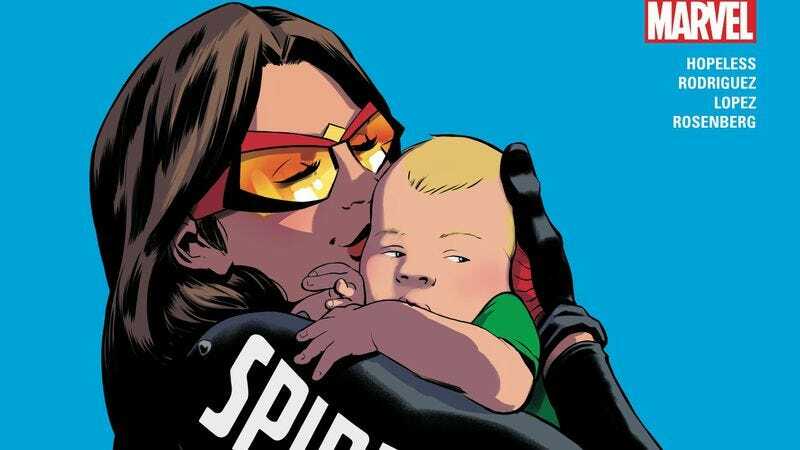 Jessica “Spider-Woman” Drew delivered her son in extraordinary circumstances with an emergency C-section in a space hospital overrun by alien rebels, but now that she’s back on Earth and situating to the whole mom thing, she’s learning the harsh reality of what it means to be a single parent. Writer Dennis Hopeless and the art team of penciler Javier Rodriguez, inker Alvaro Lopez, and colorist Rachelle Rosenberg have done some spectacular work on the new volume of Spider-Woman, which has balanced pregnancy drama with superhero badassery in a story told with stunningly inventive visuals. The last couple issues in particular have seen the art team really stretch itself to depict Jessica’s outer space situation in exciting, unconventional ways, establishing a nice point of contrast to highlight the change in Jessica’s lifestyle after her son is born. As this preview of Spider-Woman #5 reveals, Jessica’s having some trouble adjusting to her new status quo, and she’s learning that her old personal life is now a thing of the past, replaced by the constant stress and worry of having a newborn. Hopeless captures Jessica’s anxiety in his script for these pages, and her emotional state comes through clearly in the artwork, which also accentuates the hectic pace of motherhood by breaking down each of Jessica’s movement as she moves across the obstacle course that is her apartment. The story may be grounded again, but there’s still a lot of creativity in how the art team chooses to detail the script, and it will be exciting to see how the rapid changes in Jessica’s life impact the visual storytelling moving forward.